Although some chili purists insist that chili shouldn’t have beans, that doesn’t work for me. I’m not interested in eating a bowl of just spicy meat and tomato sauce. 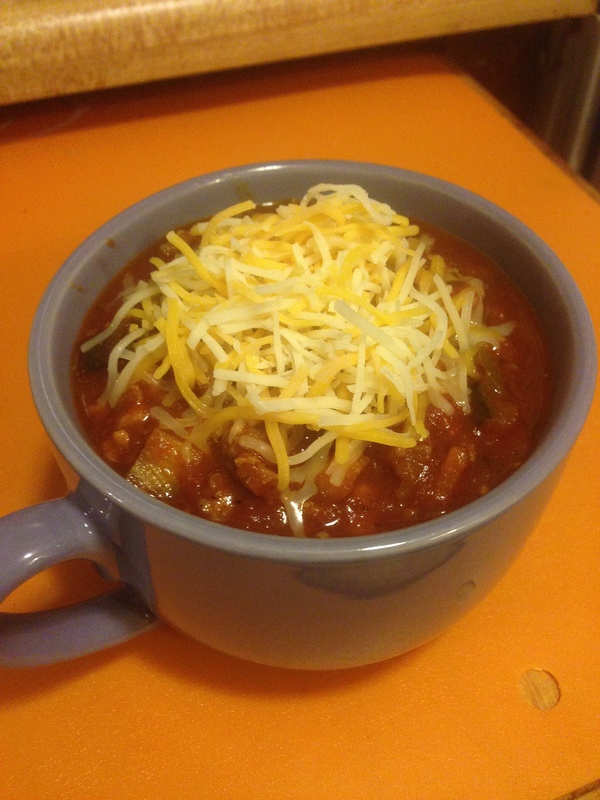 But since beans don’t work for a low-carb diet, I had to get a little creative to satisfy my chili cravings. After I tried making eggplant lasagna, I had the idea to try using eggplant in place of beans in chili. I gave it a go, but during my first attempt at this recipe, I thought I had wasted a bunch of ingredients because the eggplant made the chili taste bitter when I added it. I decided to keep simmering it anyway, and I was happy to discover that, after cooking, the bitterness faded and the eggplant turned out to be an excellent substitute for beans. In a large pot, cook the Italian sausage, ground beef, onion, bell pepper, and garlic until the meat is done and the onions and bell pepper are softened. Add the crushed tomatoes, sweetener, tomato paste, spices, and beef broth. Simmer, covered, over medium-low heat for 45 minutes to an hour. Stir occasionally. Add the diced eggplant, mix well, and simmer uncovered another 45 minutes, stirring a few times while simmering to make sure the eggplant is evenly cooked. There’s no need to salt the eggplant before adding it, just dice it evenly. If you dice it while you are preparing the other veggies, the eggplant will turn brown (just like apples brown) by the time you add it into the chili. It’s no big deal, but if it bothers you, don’t dice it until you’re ready to add it. Remove the bay leaves and serve with shredded cheese and/or sour cream.